"What’s in a name? That which we call a ‘Start-up’…"
Following hours and days of research on funding for ICT start-ups in Ireland I became increasingly frustrated with the information available. While there is an abundance of information from government and non-government sources the information unveiled did not offer much insight into our scope of research. It became apparent that it is extremely difficult to build a profile around this particular segment of the ICT sector in Ireland. The difficulty is that much of the information was grouped either as part the Irish technology industry as a whole or as part of a collective “start-up” group including non-tech business areas of professional services, social and personal services, wholesale, retail and others. For example, according to Vision-net.ie Ireland is the second largest exporter of ICT services in the world, it accounts for €72bn to the Irish economy per annum of which 3% of this revenue is generated by Irish companies. From this statistic, it is unclear if this 3% of Irish companies are themselves technology companies or if they are in the business of IT support services. In addition, if it is to be assumed these are technology companies, it is unclear if they are start-ups or SMEs, both requiring different types of funding. How much of the €72bn is generated by the non-indigenous ICT start-ups located in Ireland which fall within our scope? Similarly, Enterprise Ireland in its End of Year Statement 2014 reported an investment in 183 start-ups of which 102 were high potential start-up companies and 81 were early stage businesses (Enterprise Ireland, 2015). These 183 companies were a blend of technology and non-technology businesses. While it is known these companies were beneficiaries of funding and support it is unclear how much funding was allocated to ICT start-ups alone. From my research it is known that 1,185 technology start-ups have been formed since January to October of this year. This figure is down from 1,201 over the same period last year (Vision-net.ie, 2015). However, despite the drop in figures Ireland’s IT sector is growing form strength to strength, with the aid of government investment and support from MNCs like Google and Facebook offering investment and mentoring (McHugh, 2015). Unfortunately, it is unknown what proportion of the 1,185 start-ups fall with each stage of development, from feasibility stage, investor ready stage and growth stage. In addition, it is unknown what proportion sourced funding from family and friends, government funding or other sources such as Angel Networks and VCs firm (either exclusively from one source or a combination of sources). Similarly, the amount of government funding awarded and the number of jobs generated by each start-up is unclear. Given the difficulty in determine an accurate profile of our study population, in my view, it is almost impossible to critique funding beyond sources and types of funding available. To add further complexity, the definition of start-up came under scrutiny. The bundling of technology and non-technology businesses into the same “start-up” umbrella term as well as the differences of opinion between our blog team with regard to what exactly constituted a “start-up” prompted me to seek a definition. “A newly established business: problems facing start-ups and small firms in rural areas” (Oxford Dictionaries , 2015). This all-inclusive definition makes no distinction between types of businesses or industries and perhaps oversimplifies the term. “Start-ups are fresh, new innovative technology companies”This is a common misconception when it comes to start-ups. To claim that start-ups are exclusively technology is arguably incorrect. In many start-ups technology maybe the enabler but it is the business innovation and the growth that comes with it that makes the business a start-up and not the enabling technology. Governments, in their effort to promote “start-ups”, tend to use the all- inclusive Oxford dictionary definition by including all sorts of non-technology businesses, albeit a restaurant, barber shop or even the next Facebook. In the case of Enterprise Ireland their primary interest lies in job creation and not in the nature of the business. For that reason, they set funding criteria based on the start-ups ability to generate jobs regardless of the type of business. Entrepreneur and author Steve Blank defines start up as a “temporary organization designed to search for a repeatable and scalable business model”. 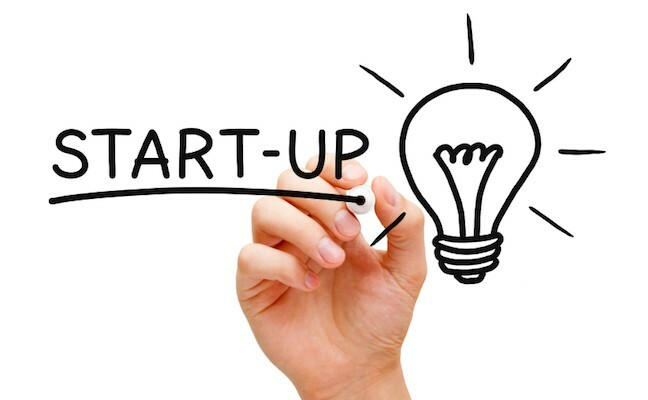 Within this definition Blank states that a start-up can be either a new venture or a new division or business unit in an existing company (Blank, 2012). Natalie Robehmed of Forbes.com profiled a start-up as anywhere between a founder of a tiny for-profit enterprise working from a bedroom with aspiration of a global reach and a company generating below $20 million, employ less than 80 employees where absolute control lies with the company’s founder (Robehmed , 2013). According to writer and investor, Paul Graham, a major attribute of a start-up is its ability to grow. Start-ups are designed to scale very quickly (Graham, 2015). “A start-up is a company working to solve a problem where the solution is not obvious and success is not guaranteed” is the definition put forward by Neil Blumenthal, co-founder and co-CEO of Warby Parker, an American brand of prescription eyeglasses and sunglasses. 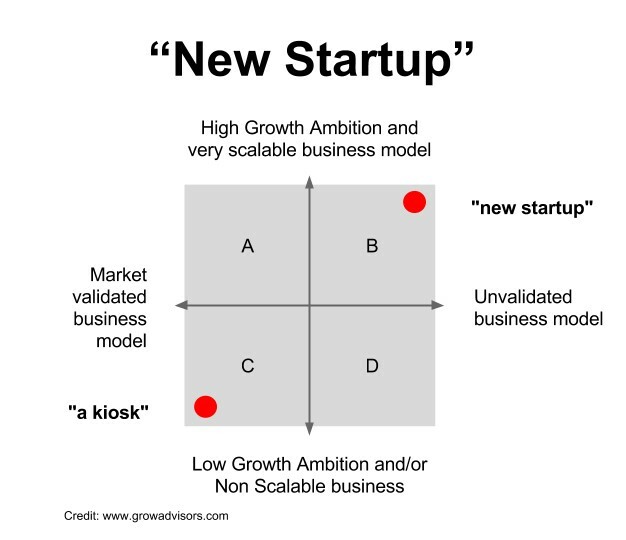 In my view, the matrix below captures the true definition of a start-up, encompassing much of what the experts say. Consider “a kiosk”, for example a ticket kiosk at a train station. This is a technology, a system with an input, process and output but yet it exists in the C quadrant because it is a validated business model with low growth and is non-scalable. Therefore not all technology companies setting out are considered a “start-up”. Quadrant B on the other hand is our true start-up, our disruptive innovation but not necessarily a high tech disruptive innovation. The true definition of a start-up is subject to debate. Taking the all-inclusive definition or refining this definition to factor a business model, growth and scalability has implications. Understanding what is meant by a start-up is fundamental for governments and investors as this will determine the level of risk and potential ROI which in turn influence the type of funding and support needed.